Save on new Science Diet Bioactive Recipe being sold at Lochte Feed & General Store. For a limited time, save $15 on one bag of Science Diet Bioactive Recipe 21.5/22.5-pound bags. Hill’s Bioactive Recipe is the perfect blend of healthy ingredients that will get your dog feeling better than ever. In addition, the all-natural ingredients provide a promising approval for taste and healthiness. 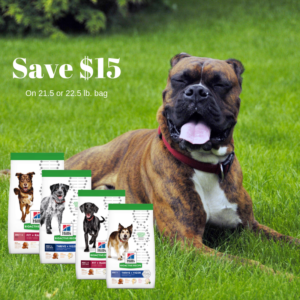 Furthermore, we offer a variety of feeds including Adult Fit + Radiance, Adult Large Breed Fit+ Radiance, Adult 6+ Large Breed Thrive + Vigor, and Adult 7+ Thrive + Vigor Dog Food. As a result to using the Science Diet Bioactive Recipe, your dog will be feeling happier and healthier than ever! This entry was posted on Friday, January 25th, 2019 at 10:43 am	and is filed under News & Updates. You can follow any responses to this entry through the RSS 2.0 feed. Both comments and pings are currently closed.